Recently I was at the bookstore, sans kids, flipping through some magazines. After being in Copenhagen's Magasin though, and seeing their extensive collection of magazines (of which I prefer the style to most American publications) I'm always a bit disappointed with our local options. I try anyways to look through art or design zines of different disciplines in case I find something noteworthy, anything that I might uncover that vibes with my own interests and style. Well I grabbed one off the shelf that I had never seen before, and I am sorry to say I have already forgotten the name of it. It was a long shot, the cover was ok but had a minimal layout and even though most of it was just so-so I did read this spread about a cabin renovation in the Swiss Alps. 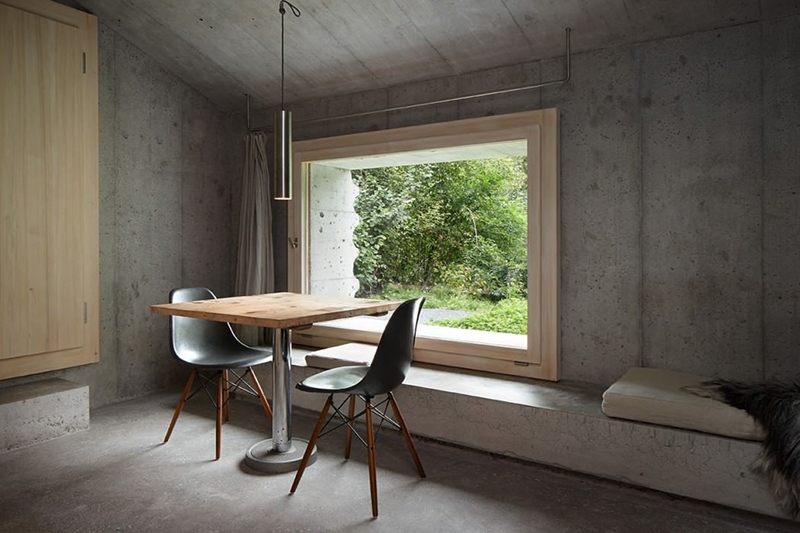 The solid concrete interior and exterior caught my attention and I thought it so interesting to hear about the architects' thought process for this. The original wooden structure needed to be left somewhat intact, or somehow preserved with the new design in order for the reno to move forward according to local officials. 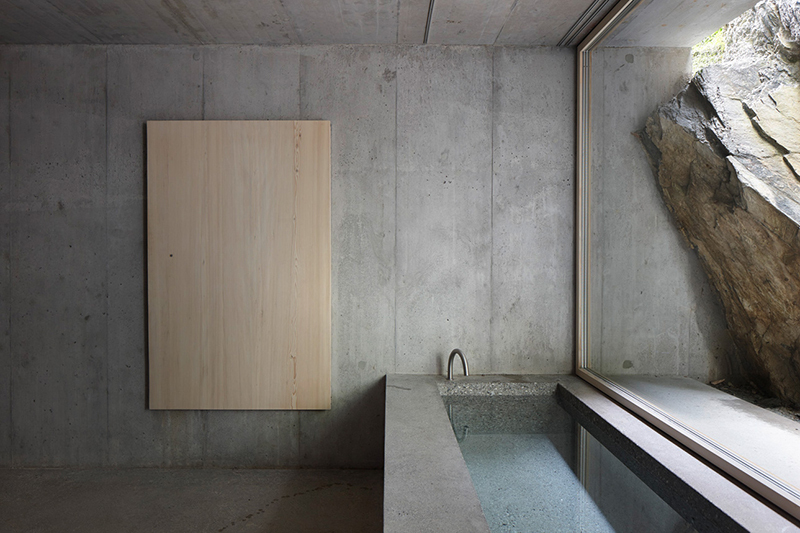 This was troublesome to designers at Nickisch Sano Walder who wanted to work in concrete rather than wood as it echoed the large boulders that sat at the base of a mountain nearby. The old wooden cabins that sat among the hills in that area looked rough and aged in contrast to a more durable and timeless material such as concrete. 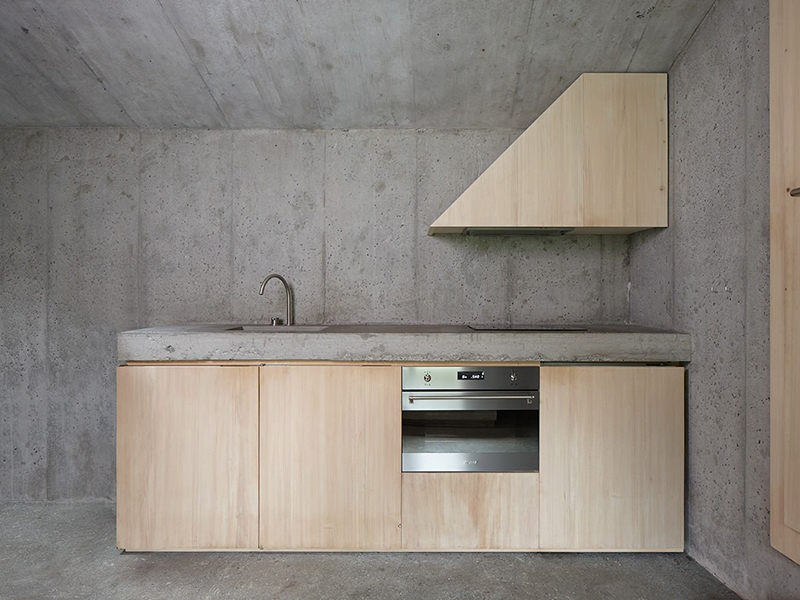 Brilliantly they molded the concrete around the existing wooden frame which left beautiful impressions from the original wood grain in the finished concrete. Most of the concrete surfaces are heated so there isn't a cold feeling, even in the dead of Winter. 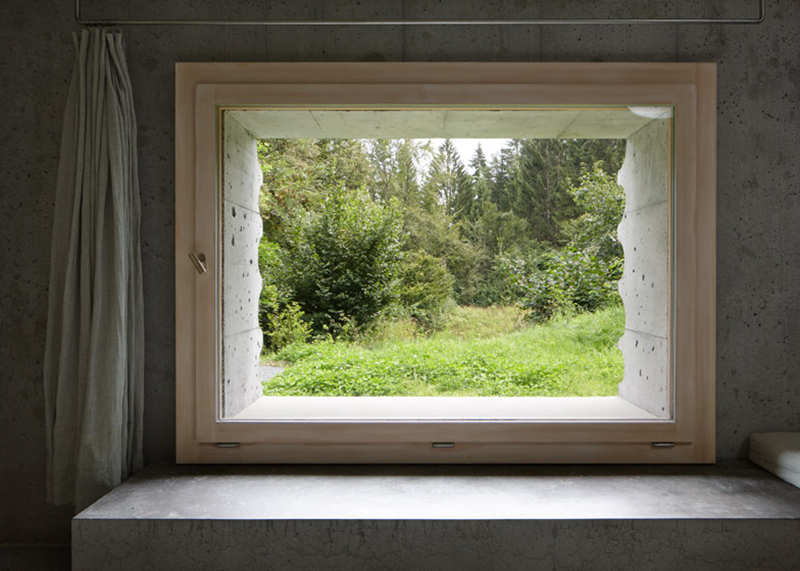 The large, low window in the dining area is an idyllic view to the forest floor and the wildlife that lives in the area. You may see a fawn grazing right outside your door. 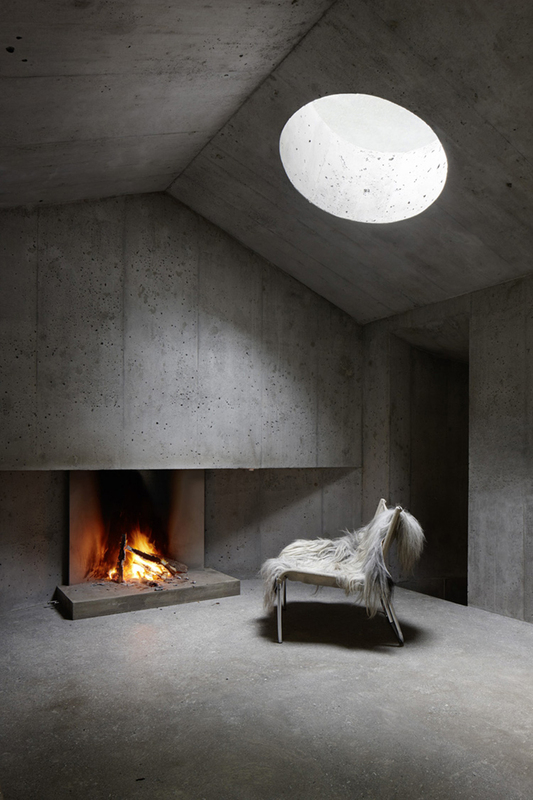 I also love the circular skylight, it must be a beautiful view of the stars at night. If what I read in the magazine is correct, the cabin is available to rent by visitors. Someday I may have to stay a few nights here myself. Great find! Imagine if you have no good mags, here we have non, so importing is the thing. Great day. really would like to visit, this looks great! Love the fact that the space is so original, and beautiful at its most naked state.